Do you have a fat duck, goose, pheasant or wild turkey in the freezer. This recipe is designed for the wood oven but you can also use it in for your birds in the regular oven. This recipe is meant for birds that have been plucked and have a layer of fat under their skin. The fat is important as it will melt and help baste the bird as it cooks. 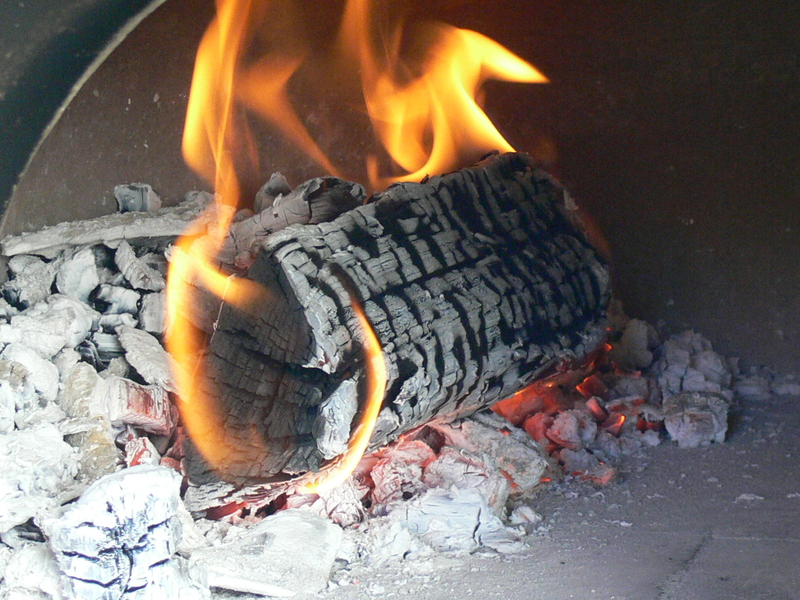 A wood burning oven tends to have hotter and drier heat then a regular oven. In addition to any fat you add to the bird, the birds own fat will keep the meat moist while it roasts. 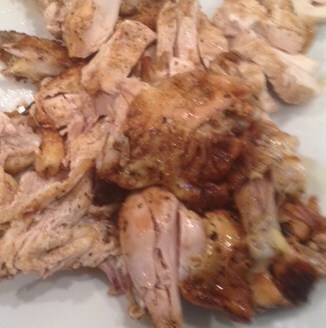 Since I have no wild birds in my freezer, I chose to use a free range organic chicken to illustrate this recipe. Of course, the best chicken flavor and meat is going to come from a backyard chicken or a chicken from a family farm that has led its life chasing bugs and pecking seeds and weeds. If you live in farm country, these kinds of chickens are easy to find. If you live in a big city or metropolitan area, it will take some research to find a purveyor of these types of chickens. 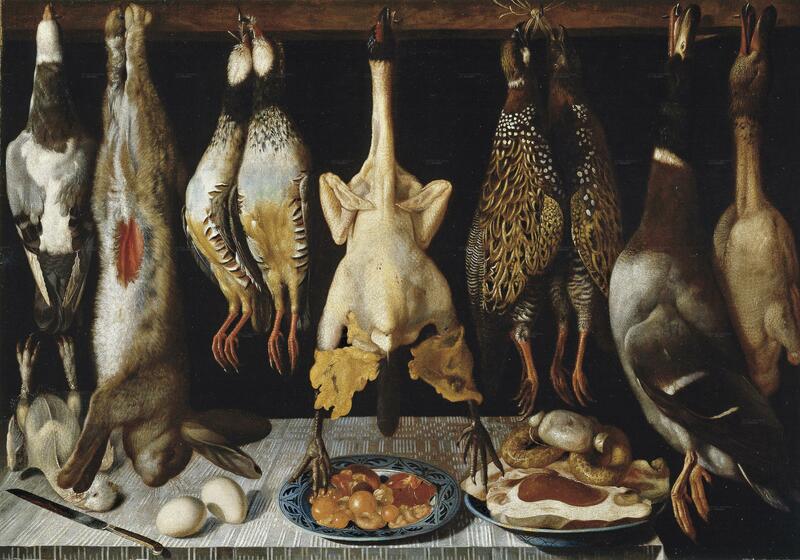 Whole, chicken or large game bird cleaned and plucked. Juice of 1 1/2 lemons. Build a fire in the wood oven using oak, apple or cherry wood. 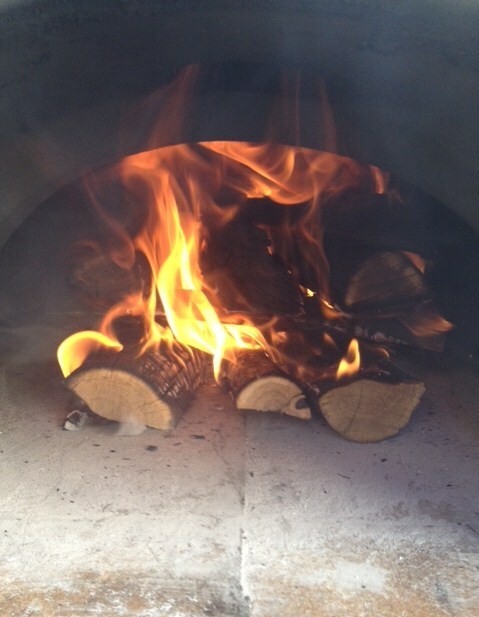 When the wood has burned to mostly white hot coals with a little bit of flame, move the coals to one side of the oven. Add a piece of wood to the fire to keep the temperature in the oven steady. Add wood as needed during the roasting process. Rinse the bird and pat dry. Make sure you rinse the birds cavity and pat dry as well. Take some olive oil and coat the cavity. Salt and pepper the cavity and add the 4 garlic halves. Squeeze half of the lemon on the inside of the bird and place the squeezed half into the cavity. Seal the cavity with the other half of the lemon. Place the bird into a roasting pan. Cover the whole bird with a generous amount of olive oil. Squeeze the juice of half a lemon over the skin of the bird. Season the bird with the garlic powder, onion powder and Herbs De Provence. Take the potato quarters and place around the bird. Season the potatoes with olive oil, salt and pepper. The potatoes will also be seasoned by the fat and drippings from the bird. 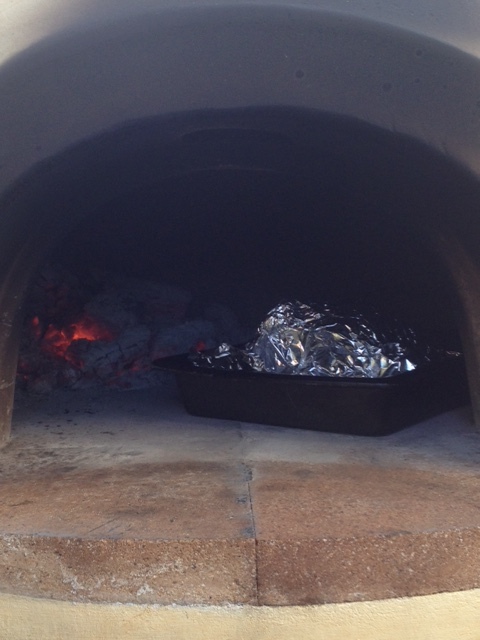 Place the bird into the wood oven for about 5-8 minutes to brown the skin. Make sure you watch the bird to ensure the skin does not burn. Once you have a nice brown color on the skin take the bird out of the oven and cover the whole pan and bird with aluminum foil. Place the bird back on the deck of the oven with the pan slightly protruding into the oven. The temperature in this area should be about 350-375 degrees. The side facing the interior of the oven will be hotter then the side facing out. It is important to rotate the bird about every 8-10 minutes to make sure it cooks evenly. Remove the aluminum foil and baste the bird at least 3 times or every twenty minutes. Put the foil back over the bird and continue to cook. A 4 to 5 pound chicken should take about 40- 60 minutes to cook. 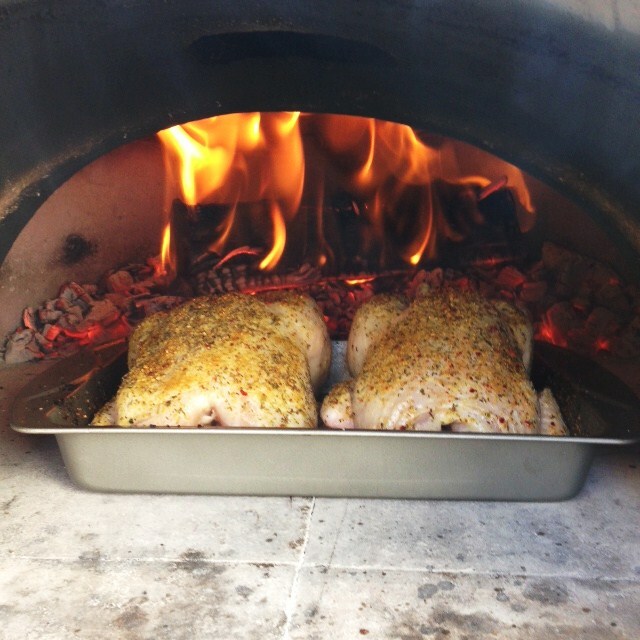 The timing depends on your ability to keep the heat in the oven fairly constant, size of the bird and the bird type. After 60 minutes, check the internal temperature of the bird for desired doneness. The following internal temperatures are recommended for different game birds in degrees Fahrenheit. The potatoes should be done when the bird is finished cooking. If not, remove the bird, set aside and cover. Place potatoes back into the oven until done. Cut up the bird into its different parts. Pour juices from the cutting board over the bird and sprinkle with chopped parsley. Serve immediately with the potatoes, a salad and a glass of Sauvignon Blanc. Enjoy! This is the new Wild Forage Cookbook! Check it out, I think you will like it. Available in both Kindlel and paperback. I love to cook Southeast Asian recipes and I am particularly fond of Vietnamese food. 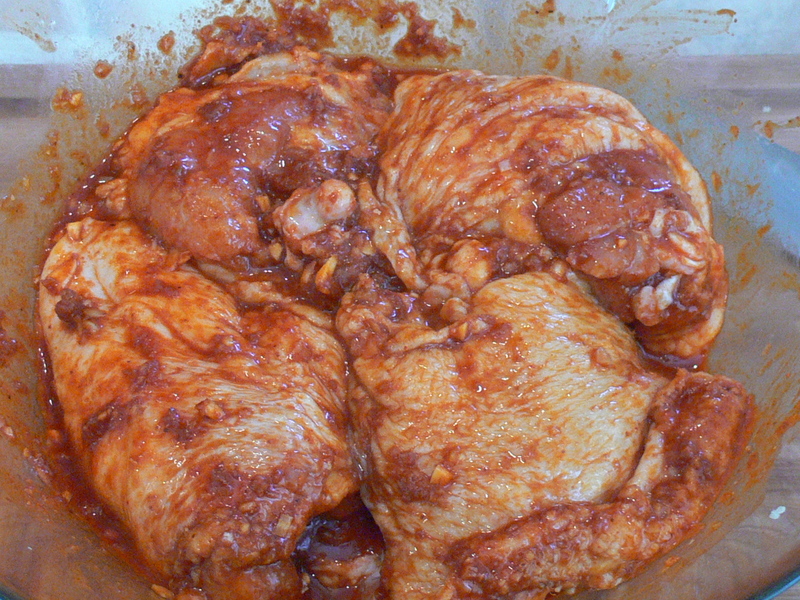 This recipe will take your ordinary BBQ chicken recipe to a new taste level! I love to use this recipe on chicken, pheasant and rabbit. Do not be afraid of the shrimp paste. It is just fermented dried shrimp. The aroma of shrimp paste is more pungent then fish sauce but once combined with the other ingredients it adds a depth of flavor, color and fragrance to a dish that has to be experienced to believe. Shrimp paste is not readily available in most grocery stores so it may be necessary for you to visit a local Asian supermarket to get this ingredient. For the best flavor, I recommend that you marinate this dish overnight. This marinade also works well on catfish, bass and other panfish. Give it a try this summer at your next BBQ. Your friends will love it so much that they will be begging you to cook it again.